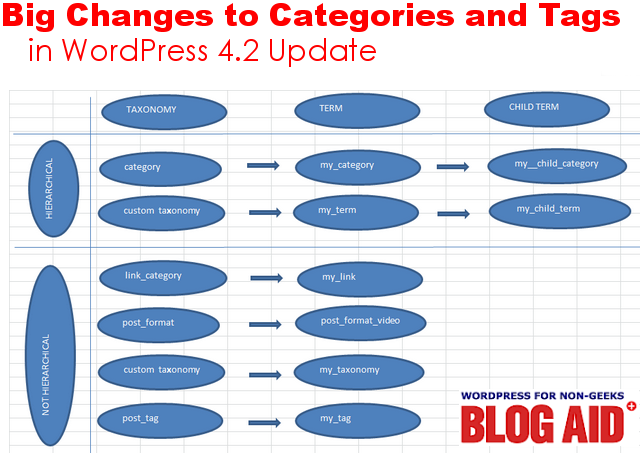 Your categories and tags, and any plugins that use shared terms, may be adversely affected in the coming WordPress 4.2 update when all old shared terms will be split. The update will fix a seven year old bug in WordPress. It’s the kind of thing core devs have been trying to clean up with each update. The current proposed change involves term sharing and term splitting. You use terms and taxonomies all over your site. Common examples include categories and tags. Here’s how this old bug affects them. Let’s say you have a category called Dinner and a tag called Dinner. And then you change the category to Entrees, the tag would be changed too. They are shared. Changes to the core in WordPress 4.1 disallowed that kind of term sharing going forward. The update in 4.2 will affect older terms that were shared. In other words, they want to split terms so that changing one does not affect any others. The devs ran a test of some very popular plugins that use shared terms. They found 10 out of 100 to be potentially affected. 10% is a lot of plugins affected. I suspect there are lots more. WP Find Shared Terms is a plugin on GitHub to detect shared terms. GitHub is a super repository for open-source plugins and themes. However, being hosted there means that you will need to manually install this plugin. Look for the Download Zip File button at the bottom of the right sidebar. And, some developers that post to GitHub do not offer automatic updates, like you see while in the admin side of WordPress. I didn’t see any documentation about it from this plugin developer. So I suggest you use it and then delete it. If you want to use it again, get a fresh download. Go to Tools > Find Shared Terms to find the sub-link to run the plugin. All it does is detect and output a list. I suggest you run that plugin now and see how many shared terms you’ve got and what might be affected. It’s very likely that all of those popular plugins will be ready when the 4.2 update rolls around because they are actively supported now. But, this will also likely cause me to advise a delay in updating to 4.2 until all affected plugins are fixed. When I ran the plugin on my site, I only found shared categories and tags. I haven’t used tags in years. So, I might actually just delete all tags that I had used in the past and not worry about it. However, I did find one other shared term, and that was for Easy Digital Downloads, which was not on the list of popular plugins the devs checked. Shared terms gets into a lot of other things. All of these use custom post types with custom taxonomies and may be affected. I’m currently running tests on all of my sites and my managed client sites and will be updating this post with what I find. It will be April before the WordPress 4.2 update will be released. So, that gives a little breathing room to get things in order, and for developers to get their plugins updated. But, we all know many will wait until the break reports start coming in. I would strongly encourage you to make a plugins list. Visit my Successful Site Owner Series And see the Plugins section for easy tips to create your own plugins list. That will help you get ahead of the curve on this, and all future WordPress updates that may affect your site. If you’re uncomfortable looking under the hood of your site by yourself, I totally understand. Get a Site Audit and see what’s really going on with your site and your whole hosting account. (That’s actually where I find the most security issues.) We’ll also check your plugins list, and any that you’ve tried and deleted and may have left orphaned folder, files, or database tables. Get clean, get lean, and keep your site safe.